Film Florida offers ten distinct levels of sponsorship to the organization. Film Florida’s sponsorship packages aren’t your average sponsorships. Unlike most sponsorships where your investment is earmarked for one particular event, Film Florida sponsorships are year-round. When you become a SPONSOR of Film Florida, you become a MEMBER of Film Florida. Most of Film Florida’s sponsorship levels give visibility at all of Film Florida’s signature events, quarterly meetings, film festivals, national industry events, trade shows and more. 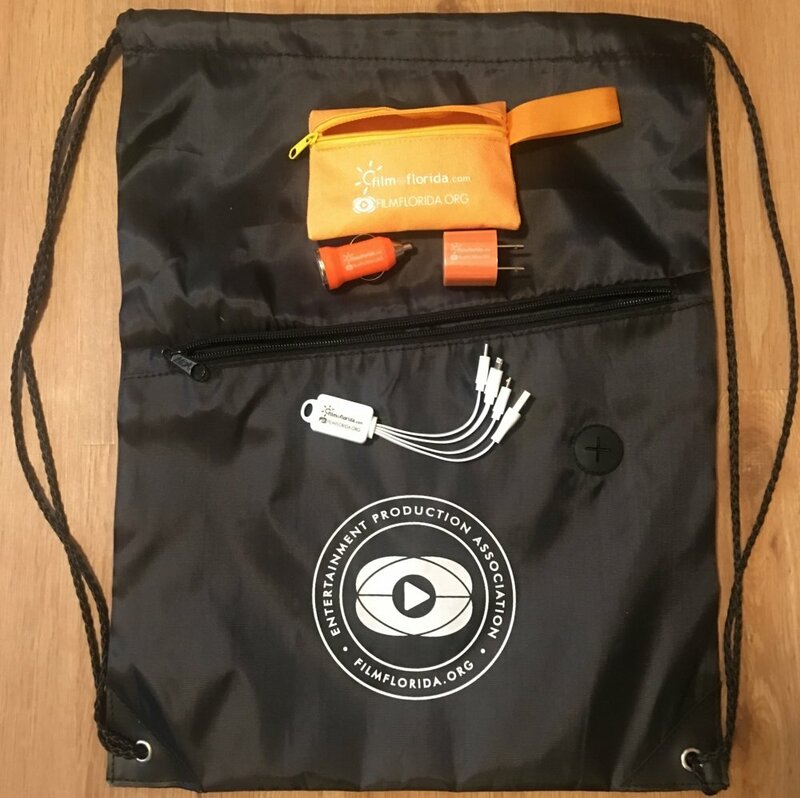 Click HERE to Join and don’t forget, all new and renewing members get a FREE drawstring backpack and tech charging kit. One of the paramount benefits of membership is networking with your peers in Florida’s entertainment production industries, not only at the quarterly Film Florida meetings, but also within the individual council and committee meetings. It is here that you share interests, ideas, problems and concerns of the industry. Bring your issues to the table whether it is one for your specific council, or the whole of Film Florida, you will be amazed at the proactive capabilities of this organization. Whether it’s promoting state incentives or proposing industry legislation, Film Florida is the organized and effective voice of the industry. We pride ourselves in maintaining and cultivating working partnerships with government officials and organizations in Florida. As a member of Film Florida you help decide how to best market Florida to increase production throughout the state. Your participation is vital to best serve the industry’s needs. Attending important trade shows, conferences, and film festivals becomes much more feasible with a limited marketing budget when you pool the costs with other Film Florida members. This saves a considerable amount of money while offering you excellent marketing opportunities and access to industry decision makers including finance executives, distribution executives, studios executives and more. Affiliation with Film Florida gives you professional credibility, as well as exposure through the membership listings available on our website. We also give priority to our corporate members when it comes to marketing projects, news, announcements, and/or events through social media marketing by actively promoting our members. "Working in Miami was a great experience. The technical crew was great. The help we got from the various film offices was extraordinary."